The SVMX is a premium, ‘no expense spared’ stereo on-camera microphone, designed to bring the highest possible quality immersive audio to DSLR (and full-size camera systems alike). 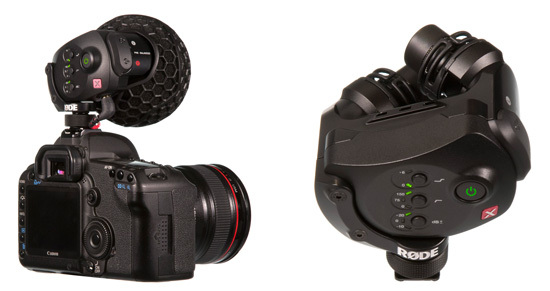 And like other RØDE VideoMics the SVMX is a plug-and-go solution. It is expected that the RSVX will be available in the UK later this month and the recommended retail price will be £649 inc vat. The RSMX has an acoustically matched pair of externally-biased, true condenser capsules, which are independently housed in integrated Rycote® Lyre multi-axis shock mounts. It’s body is constructed from aluminium, makes it lightweight whilst also offering RF Rejection. In addition to 3.5mm stereo output, the SVMX has the option of outputting a balanced signal via mini XLR, and both can be used simultaneously. The rear panel of the microphone features a range of adjustments including a three-stage high pass filter (0/75/150Hz), a three-stage level control (-10/0/+20dB) and a frequency boost to help pick out high frequency detail, such as voices. The boost has also been designed to compensate for any high frequency loss suffered when using wind protection. For the first time on any Rode microphone these settings are accessed via press-button digital switching and the SVMX will even retain your settings when the microphone is powered off. The microphone can be powered by either an internal 9V battery or by the P48 phantom power via XLR. If you are in the market for a stereo location sound mic that will fit on a DSLR camera then check this out. The SVMX like other Rode mics has a 10 year warranty.